The south and west of Tanzania are often overshadowed by the more famous and iconic Serengeti Safari and Ngorongoro Crater in the north. However these areas offer incredible game viewing and a range of safari activities such as boating/walking safaris and fly camping. 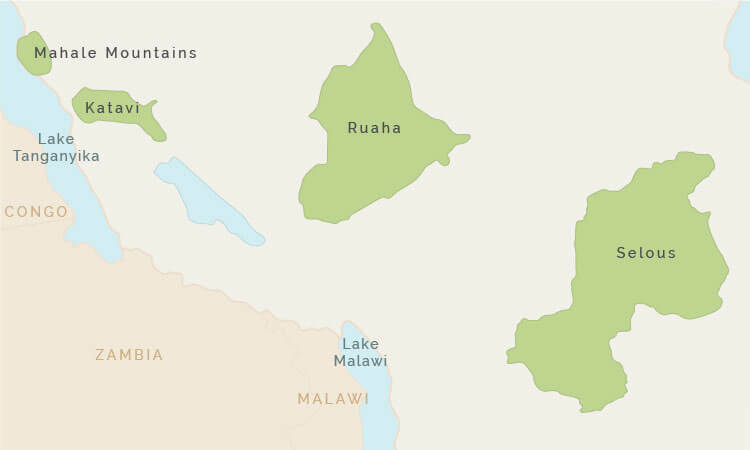 The western parks, Katavi and Mahale, are even more remote and wild - and expensive to reach! - thus less frequented by travellers and more exclusive. Why go on a Southern Tanzania Safari? A Southern Tanzania Safari is very highly regarded by safari enthusiasts for a number of reasons. Firstly the game viewing - these areas offer a good variety and density of game, an interesting crossover of eastern and southern Africa species, and plenty of predator action. In addition, open-sided safari vehicles enhance the viewing experience, in contrast to the closed-sided vehicles used in the north. Secondly, the huge parks and reserves offer visitors an uncrowded and more exclusive game viewing experience with few other vehicles and tourists (the contrast with the more crowded northern parks is stark), and a good sense of the vastness of the African wilderness. Finally, the south and west of Tanzania offer a wider range of activities than are available in the tightly-regulated national parks of the north - as well as the usual daytime game drives, there are walking safaris, boating safaris, fly camping and even mountain trekking to find wild chimpanzees! The south and west of Tanzania are often overshadowed by the more famous and iconic Serengeti and Ngorongoro Crater in the north. Some agents feel that the south and west are better suited to the seasoned safari-goer and don’t recommend them for a first timer - however we would disagree! We have sent thousands of first timers to southern Tanzania where they have had an excellent safari experience. Southern Tanzania is particularly handy if you are looking to combine safari and beach, see our blog to find out why. How to get around on a Southern Circuit Safari? Selous Game Reserve and Ruaha National Park in the south are accessible by daily scheduled light aircraft flights from Dar es Salaam, which makes it very easy to arrange safaris of any duration in these parks and also to combine them with a beach element on either the mainland coast or Zanzibar. The southern and western camps offer good value for money compared to the northern parks with camps from around $450 per person per night up to $1,000 pppn.